I made these because of the gorgeous yarn that Imeng from Cavite, Philippines gave me, a beautiful melange of gold, silver and bronze colours. The yarn was the last thing I needed to complement the beads that came from crochet friend Carol from Washington, USA. These necklaces were made by stringing the beads and then crocheting with simple chain stitches. A similar design which I made a few years ago is The Beaded Chains Bracelet, the free pattern available on Ravelry. So these necklaces are really just variations on that design. One necklace uses a shell pendant which I picked up from the beach on Pamilacan Island. A variation on design can be made by twisting the strings of crocheted beads together. Other variations can be made by making knots in the necklaces. It’s also fun selecting colours – I have made darker necklaces and one which has a lighter set of colours. The pink and gray combinations are also quite beautiful. 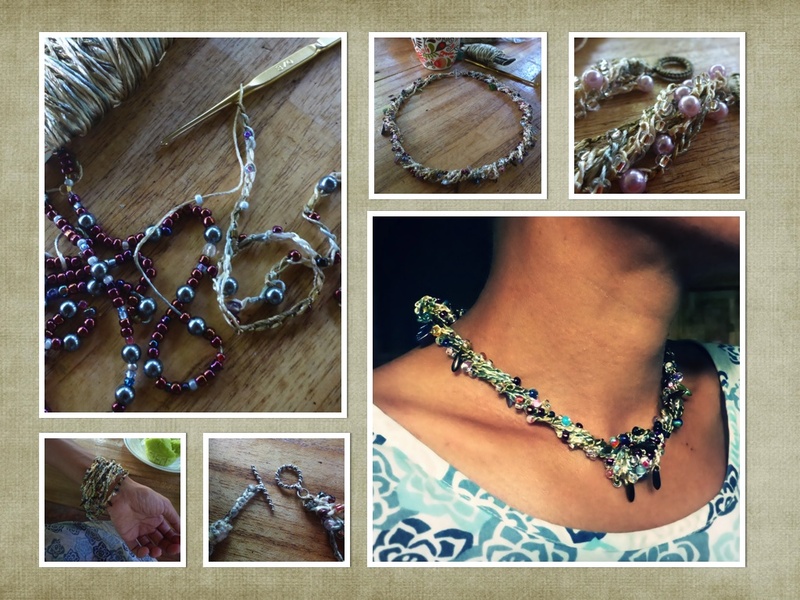 I hope to make more bead crochet jewelry and come up with more complex designs, as time and energy permits. Try bead crochet and have fun!